NETWORK UPDATE: Both SCORPION and NCIS: LA gained an additional 0.1 in final numbers. BETTER CALL SAUL (AMC) was sure to take a hit without the monstrous lead-in that THE WALKING DEAD gave it on Sunday. It fell by more than half, but at 1.63 it was still quite strong, and led all of cable on Monday night. Another promising sign was that despite the millions who had watched it on Sunday, another 0.69 of 18-49s tuned in for the pilot rerun (not on the chart) at 9PM. (It also won’t hurt that the 2d hour of SAUL was even better than the 1st.) After that new arrival, the night settled down to its usual leaders, with LOVE & HIP-HOP (VH1) down 0.08 to 1.38 (lead-out BLACK INK CREW was down 0.05 to 1.07), and WWE (USA) at 1.22-1.18 over its 3 hours, down about two-tenths from last week. On Discovery, STREET OUTLAWS rose 0.05 to 0.97, while FAT N FURIOUS lost 0.06 to 0.43. Bravo’s VANDERPUMP RULES dropped 0.11 to 0.77, and FRIENDS TO LOVERS gained 0.03 to 0.28. History’s SWAMP PEOPLE was up 0.05 to 0.68. On ABCFamily, THE FOSTERS slipped 0.02 to 0.45, while CHASING LIFE gained a tenth to 0.36. (As usual, both were far stronger in their target Female 12-34 demo, at 1.22/0.97.) 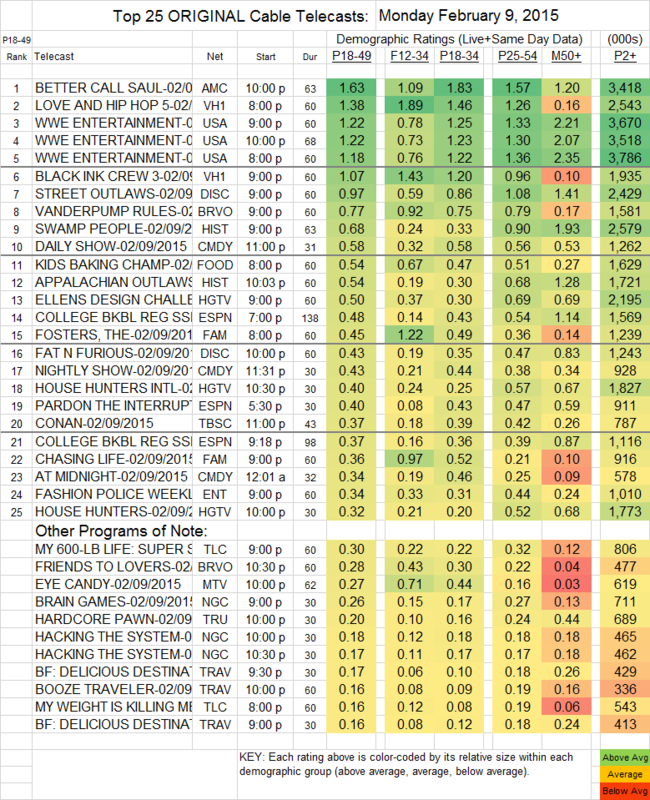 EYE CANDY (MTV) was stable, rising 0.02 to 0.27 (and 0.71 in the target demo).